...ok, so, Reason 6 is almost around the corner (erm... still 33 days to go...) right? With it, we'll be able to finally go beyond the 3Gb RAM limit of 32bit apps by running the 64bit version of it! 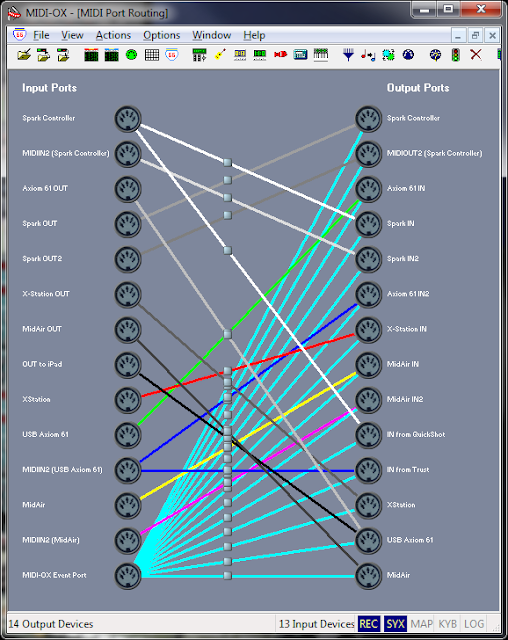 What will happen to those that were able to install the 32bit Midi Yoke + MIDI-OX version on Windows 7 64bit OS ? Well, those relying on such solution will get an unpleasant (though expected) surprise: the ports made available by the 32bit MIDI virtualization (aka loopback) driver won't be visible to the 64bit version of Reason. I've been following the work of Tobias Erichson, namely because of the MIDI over LAN solution he made. Recently (ok, July of this year... and thanks to Sterievo for warning me about it) he made available a tool based on something he was already using on the other available products. 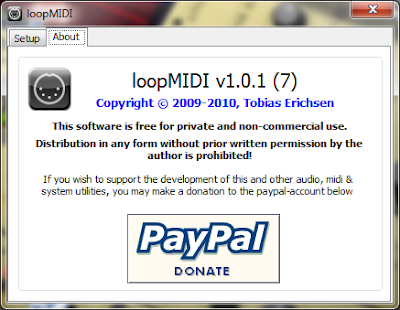 loopMIDI is the perfect 64bit substitute for Midi Yoke, IMHO. It's dynamic in creation/destruction of virtual ports, so you can create a new needed one on-the-fly, unlike Yoke, and also unlike Yoke, it let's you do custom naming of the port being added, something very useful when you deal with a lot of'em (like I do). 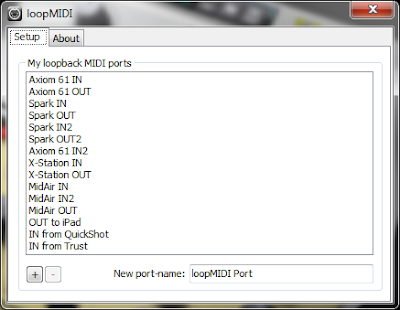 I still use MIDI-OX as my virtual cabling management and MIDI filtering solution but now over loopMIDI created ports instead of Yoke. 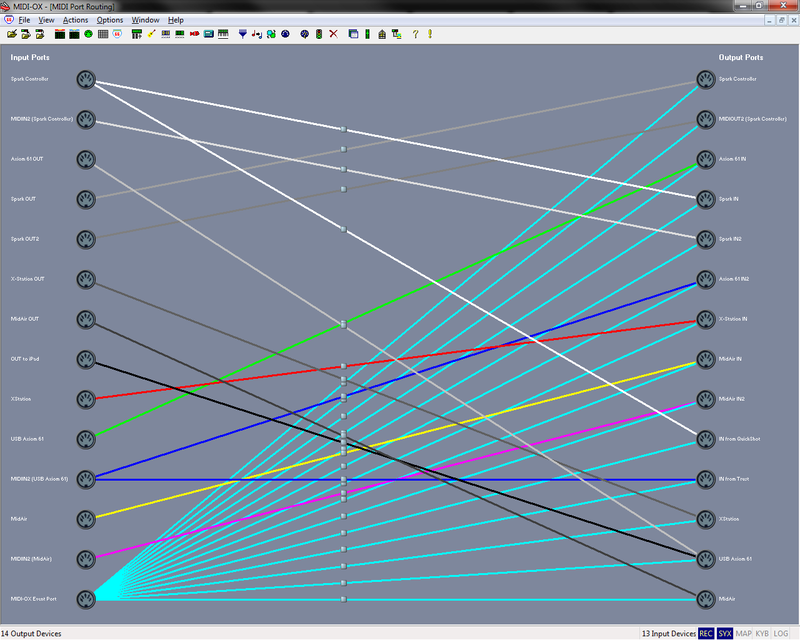 uh... kinda complex and looks a bit confusing, doesn't it? 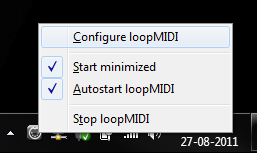 Thanks to loopMIDI custom naming, I can add extra "proper" names to existing (also named) virtual ports to quickly find the controller I want. So, for instance, I have my iPad receiving MIDI from my Axiom OUT port. I can either send MIDI to "Axiom OUT" but it's quicker to send to "OUT to iPad" if I'm not sure to what port I have it connected. Same thing with QuickShot and Trust controllers. Both are not USB controllers so they need a MIDI In to be used on one of the other USB MIDI interfaces (controllers in this case). Sometimes I change my setup and and the physical connections, so currently I have QuickShot MIDI Out connected to Spark's MIDI In. Spark's real input is cloned into 2 virtual MIDI ports: "Spark IN" and "IN from QuickShot" so I use whatever I need at the moment. Using "IN from QuickShot" will always make sure that I'll have the correct controller I want, as long I as update the virtual map configuration whenever I change the setup, which I normally do. This setup isn't using the multiple Axiom sections I used to have, like a Axiom Pads, Axiom Faders etc... all done with port cloning and MIDI-OX filtering, as referenced on some of my older posts. UPDATE2a: Still limited to 16 ports but the scroll bug that made it hard to access the 16th port is fixed.